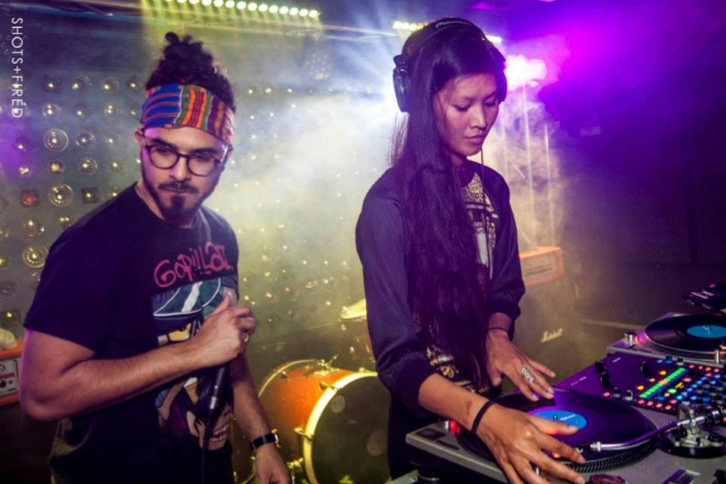 American Born and Raised in Lancaster, PA, ​Anna Dang​ aka ​DJ ANNALOG;​ started djing at the age of 18 in Orlando, FL. As a p​rominent​ female, Vietnamese, vinyl dj;​ she loved the pureness of sound created by cutting and blending wax, hence her name “Annalog”. In her several years of Djing, she has transitioned to using serato and has held several club residencies in her now base of H​onolulu, and prior : Orlando, LA, NYC, and Paris.​ When you hear her live, you can tell that as a music cultivator and tastemaker, her repertoire spans widely from old school ​reggae, 90’s hip hop and funk samples to modern day trap, deep house and EDM. ​Matthew Law, Q­Tip, Dj Spooky, Alex Metric, Baauer, Dawn Penn, ​Nina Sky​, ​Skrillex​, Bassnectar, Pretty Lights, Ghostface Killa, Rahzel of the Roots, Dj Craze, ​Major Lazer​, ​Diplo​, Thomas Bangalter of Daft Punk, ​Nate Donmoyer of Passion Pit​, and many more. Venues performed at​: Club Haussman (Paris, France), Hacienda Clandestina (Costa Rica), The W Hotel (London, England), Snowboard Garage (Davos, Switzerland), The Modern (HI), Safehouse (HI), Surfer Bar (HI), Nextdoor (HI), M Nightclub (HI), Bar35 (HI), Trump Waikiki (HI), Manifest (HI), Avenue (NYC), Highline Ballroom (NYC), Santos Party Haus (NYC), The Flat (NYC), Le Baron (NYC), Tokya (NYC), Lit Lounge (NYC), Webster Hall (NYC), Eyebeam Art Gallery (NYC), Beauty Bar (NYC), Gallery Bar (NYC), Baby’s All Right (NYC),The Exchange (LA), Hollywood Standard (LA), Foxtail (LA), Los Globos (LA), Couture (LA), Satine Boutique (LA), Drai’s Afterhours (Las Vegas), SL Lounge (MIA), Bar Miami (MIA), Radio (MIA), The Chelsea (MIA), Dream Hotel (MIA), Bardot(MIA), Wall (MIA), and more. Brands/Clients​: The W Hotels Worldwide, WeSC, Nike 6.0, Vans, Asahi Beer, Anthom Clothing, Drifter Clothing, June Jackets, Satori Wheels, Upful Hardware, Creation Skateboards, Fydelity Stereo Bags, Red Bull, Stanton, Rane, Gibson Audio, Baked by Melissa, Marchesa, Hellz­Bellz, Frank151 and Juxtapoz. Her Original Mixtapes, songs and remixes have also acquired her shows and attention through publishing on ​soundcloud.com/djannalog​, ​mixcloud.com/djannalog​ as well as the W Hotels Worldwide Music App. Anna began her career as a model at the age of 15 through the Elite Model Look Contest where she was scouted in a mall, competed against thousands of girls regionally and was flown to NYC to compete in the finals. Since then she has walked and worked for many top designers. She is still signed to ELITE MODELS. And Has signed with Wilhelmina Hawaii for 2015-2017. Dolce and Gabbana, Reebok, Yoli Rapp, Ela Acosta, TJ Maxx, Wailea Jewelry, Leila Shams, Sarar, Hellz-Bellz, Marchesa, Jimmy Choo, Prada, Dior, St. Johns, Juicy Couture, Nicole Miller, WESC, Vans, Steve Madden, Anne Bowen, Saks Fifth Avenue, Adore Vintage, The Urban Collection, Fashion Fights Cancer, Louisville Bride, Orlando Magazine, Seventeen, Elle Girl, Arrojo Studio, Elizabeth Arden Red Door Salon, Ocean Drive, Gillette, Paul Mitchell, Redken, Loreal and Aquage. ​Thakoon, Balenciaga, Kaufman Franco, DVF and DKNY. THE SKATEBOARDER and ARTSY SIDE. "Art is the language we all understand...or least try to"--Anna Dang. As an artist she developed her style of creativity in all areas of her life at an early age. Her teachers understood her talents and encouraged her throughout her school years. "Whether it was my OCD of arranging everything by color, shape/form, I always had a knack for creating a piece of art out of nothing." Anna has presented found visual art installations, mixed media boards and has recently canvased her artwork on a new medium, A-typical to any Asian-American Female, the skateboard. Her love for the sport inspires her to both skate and create. Her art shows in the past have been known to draw a unique crowd. From club owners, to deejays, to down to earth poets. As a skateboarder, she has worked with and has been captured with some of the most elite skate crews and brands: High Grade Distribution: Satori, Creation, Upful; Forest Skateboards, AltarNative, Sector9, Supra, VANS, Nike 6.0, Ace Trucks, Covert Skate Shop, Brooklyn Projects and Zoo York. You can find her skating the streets where she's visiting and at her favorite spots including Makiki (Hawaii), Lower East Side (NYC), Chelsea Piers (NYC), Skatepark of Tampa, Venice Beach Skatepark, and Orlando Skatepark aka OSP.